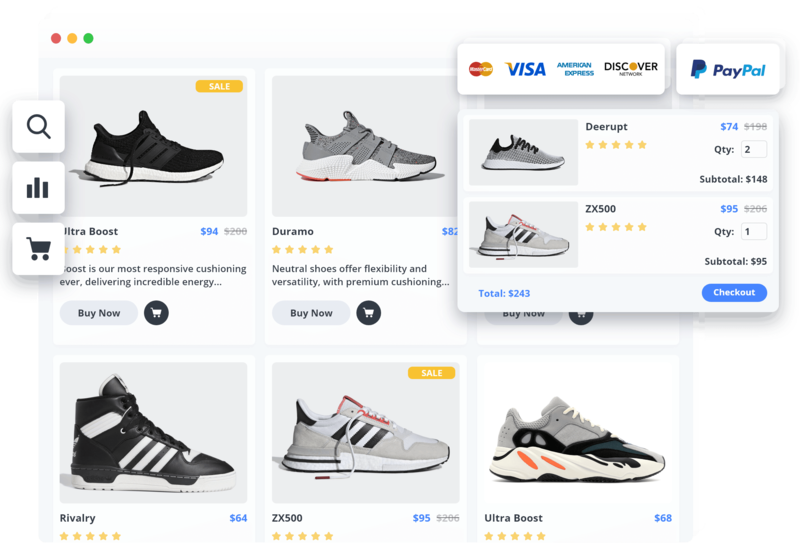 Can’t find a powerful and easy-to-use eCommerce plugin? Wasting hours managing products, payment and shipping methods? Is it difficult displaying your products in a way that match your website? Lacking an all-in-one eCommerce plugin that solves all your problems? Add your products and provide details such as price, images, keywords and more. Create custom emails to send status updates about orders. Add PayPal and Stripe payment methods. Change the styles/colors of the navigation bar, buttons, headers, and more. Add labels and pages for manufacturers. Use your theme template or create your own layout. Add shipping methods and tax rates depending on client location, product price or weight. Display products using one of 5 stunning views. Monitor your business performance, track sales, and analyze the results. Ecommerce is the best shop plugin I have ever used. Its functionality is outstanding,it is perfectly designed, 100% user-friendly, and I’m sure there’s much more to come.I haven’t done any coding in my life (not a developer), and this plugin is perfect for people like me.It’s fully customizable, has all the features we might need. Good product if you are just making your first steps in the market as a store guru.Easy shipping and taxing, product and manufacturer set up pages.I was able to create my entire product list within an hour.Just a time-saver. How I love the fact that you can simply add one productand have rest of the features listed as product parameters!It saves lots of time so that I will not create separate productfor each color or size. Superb approach. Moreover the pricing canbe different for each size and color! Nothing more to ask for.